Pop-oh-ver turns a chair into a play-prop. Playing “pretend” with plastic stove sets and foods is an iconic pattern of play that has delighted children for generations. 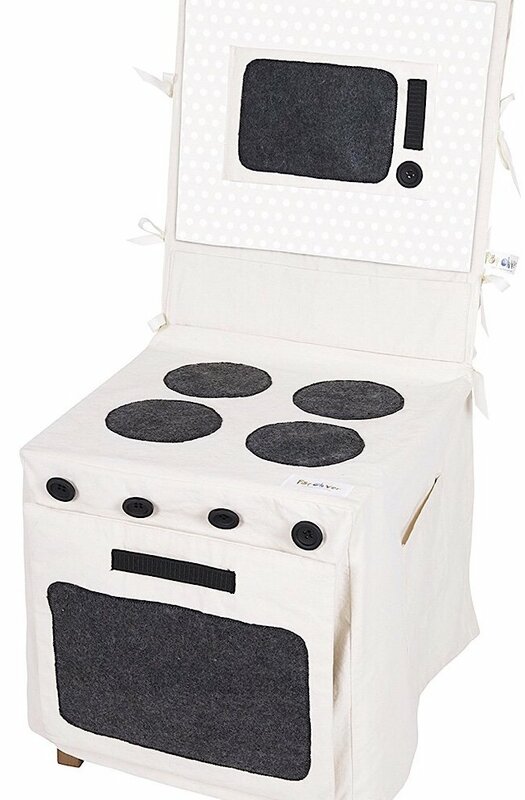 Following this tradition, Pop-oh-ver is a clever new brand of durable and detailed kitchen play sets that can be assembled in in mere minutes by throwing a fabric “stove” over a sturdy household chair. This makes it easy for children to have all the fun “pretend play” they want, without taking up space with a bulky plastic toy stove set. The “Pop-oh-ver” items are pretend-play sets that are essentially re-imagined fabric coverings for any kitchen or dining room chair that unfold to resemble real-world kitchen, stove and counter tops. The Pop-oh-ver Stove Set features a microwave door and oven door that opens and closes. Kids can’t resist touching the large black “knobs” as they pretend to cook. The The Pop-oh-ver Stove Set comes in a compact box and can be folded relatively flatly. Therefore, it is quite easy-to-store and works as advertised. For a fabric covering (somewhat akin to how children make tents out of sheets and chairs), it is impressively detailed and will enable children to pretend that they are “cooking” on the stove and turning the knobs, which are really oversized buttons. Due to a few cleverly placed magnets, the oven door can be snapped closed and so can the accompanying “microwave” on the top part of the covering. It is certainly an item that leave skids a lot of room to imagine different scenarios. The set also comes with very detailed and visual instructions about how to assemble it. It is also fairly easy to wash and clean. It is much less expensive at $40 than its plastic and wood counterparts, and can be stored away when not in use, so is great for people who don’t have a lot of room. Although this covering does generally work as advertised, it is not as highly detailed as its plastic counterparts. The knobs/buttons on the stove do not actually move and it is impossible to actually place any items into the oven which detracts from play. Although this fabric can be folded after play, it’s tricky to get it back into the box. Despite the detailed instructions, it can also be a little tricky to assemble and keep in place. Possibly the biggest drawback is that is you have chairs that are slightly larger and/or stouter than average, the covering will not fit quite right and will look a bit misshapen and/or consistently fall out of place. It comes with no pots, pans, spoons, or pretend food, so all of that must be in your child’s toy chest already or can be purchased separately from the Pop-oh-ver line. 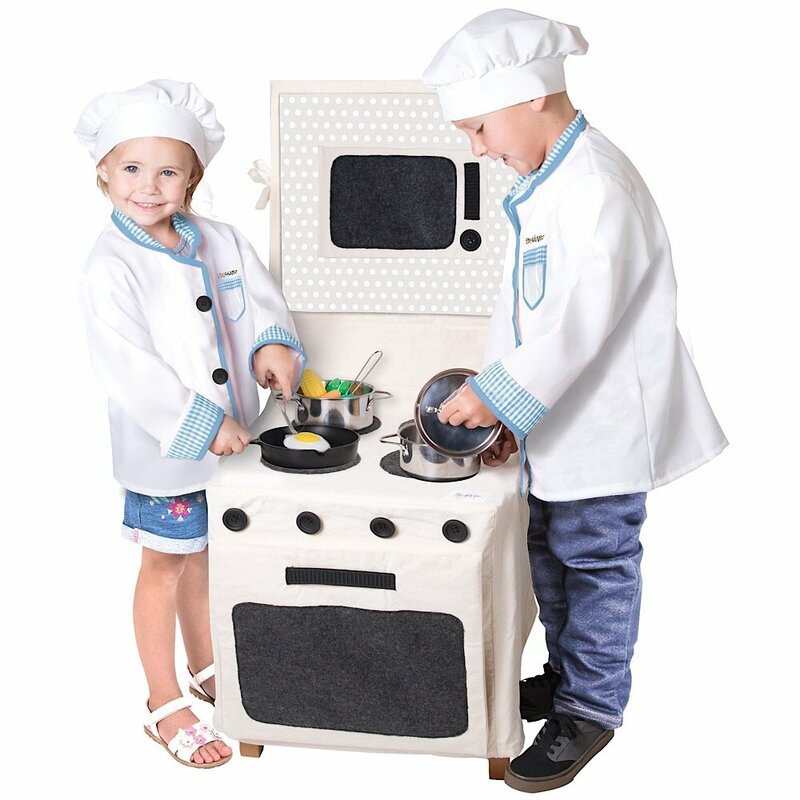 The Pop-oh-ver Stove Set is a great way to introduce children to the concept of pretending to be a chef. It is also a good way to teach them the basics about the parts of a stove, what a chef does, and even how materials can be re-designed and “repurposed” into toys. Children who like to pretend and/or would like to act in the future could benefit from having this item in their toy collection since it essentially doubles as a prop. The Pop-oh-ver Stove Set retails for $39.95. To learn more, see here. The “Pop-oh-ver” items are pretend-play sets that are essentially re-imagined fabric coverings for any kitchen or dining room chair that unfold to resemble real-world kitchen, stove and counter tops.